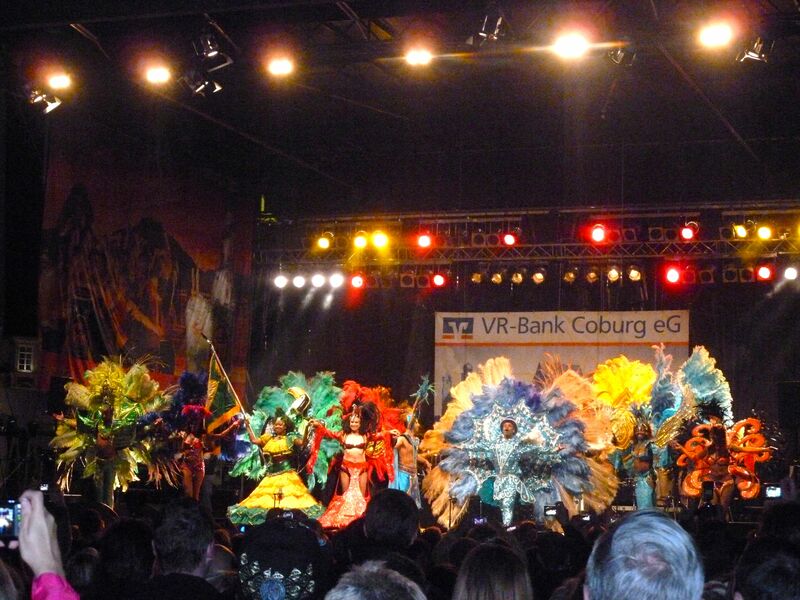 When you picture celebrating carnival, what cities around the world do you think of? Rio De Janeiro? Port of Spain? Barranquilla? There are a lot of places no doubt. A tiny medieval town in Germany would probably never cross your mind. But it should. 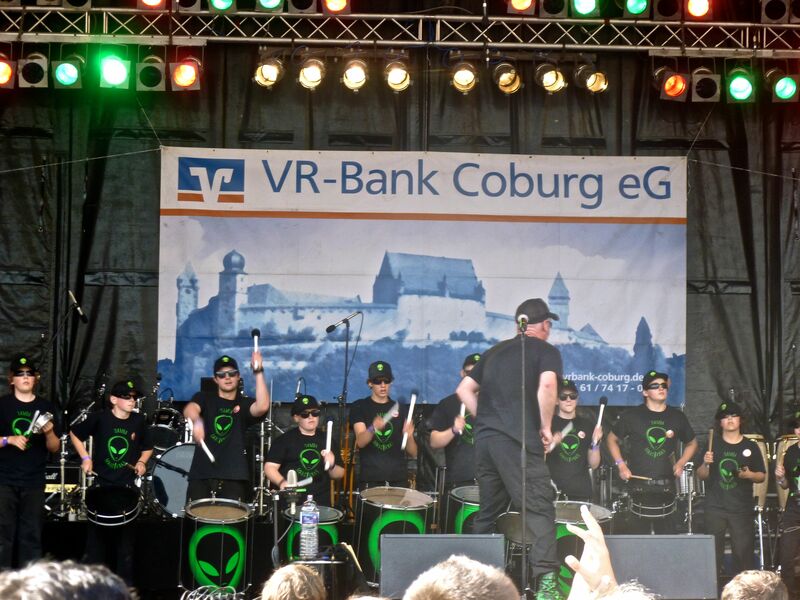 Coburg is known as the “samba capital of Europe.” The samba festival began in the summer of 1992 and attendance has grown exponentially since then, now attracting over 100,000 tourists each year. It usually takes place during the second weekend of July, from Friday-Sunday. Sambatuc from Paris on the main stage. 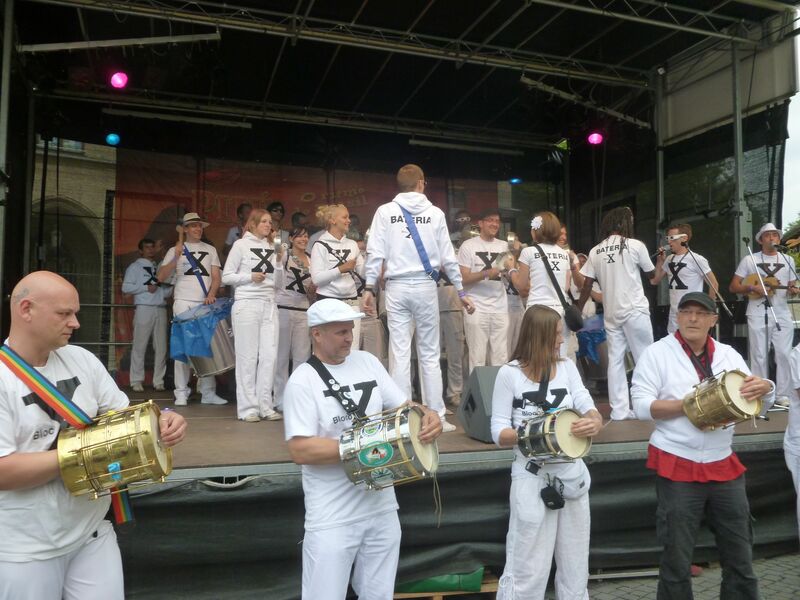 What is unique about this festival is the number of baterias (percussion groups) that come to perform. 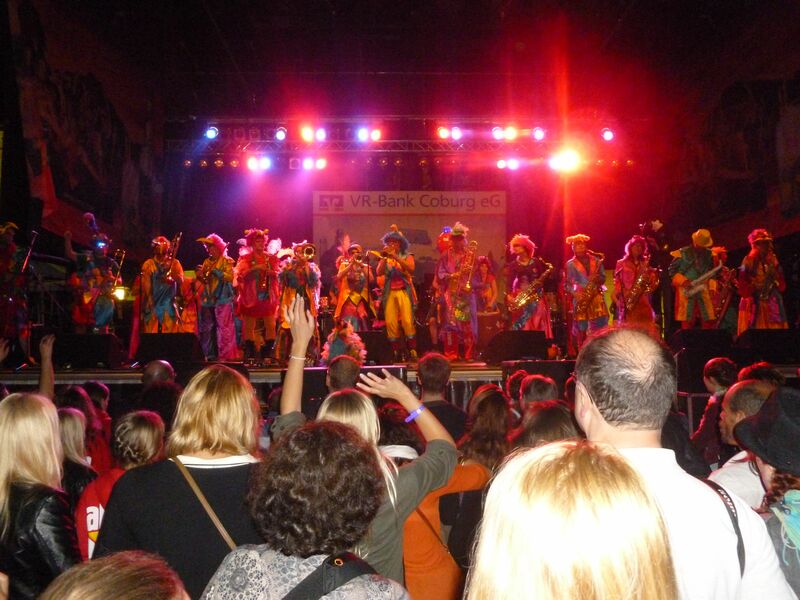 Nearly 100 drumming ensembles from all over the world come to Coburg in July to showcase their musical talents. 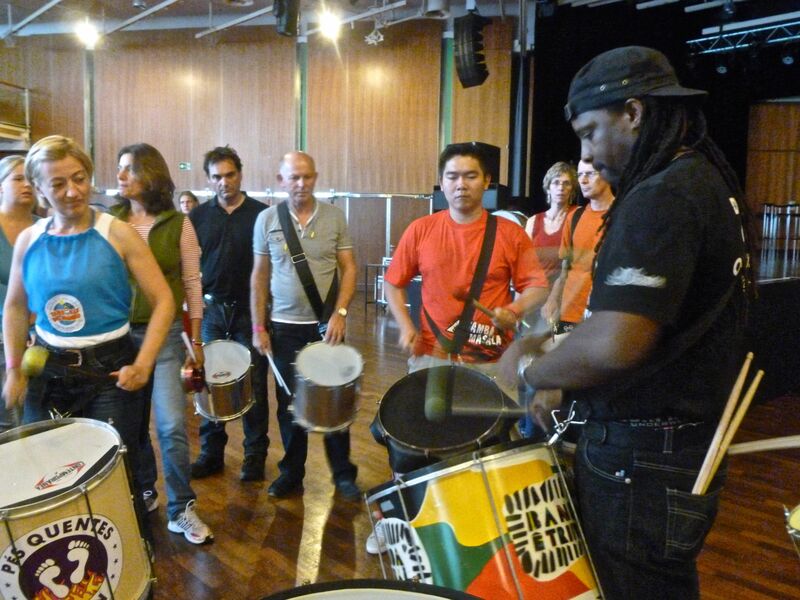 These drummers study Brazilian music and specialize in several genres such as samba, samba-reggae, samba-afro, and maracatu. 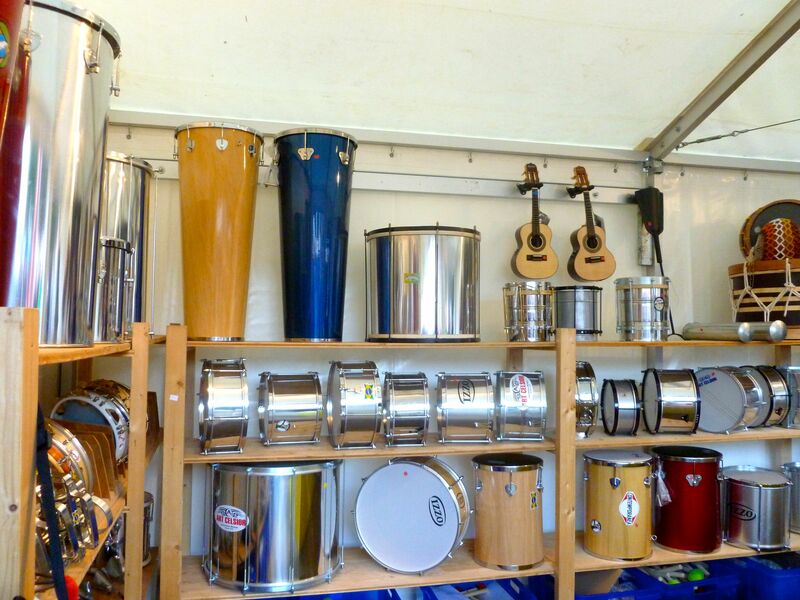 In addition, several of the baterias add their own twist to Brazilian samba, integrating other music styles, depending on the culture and musical influences. 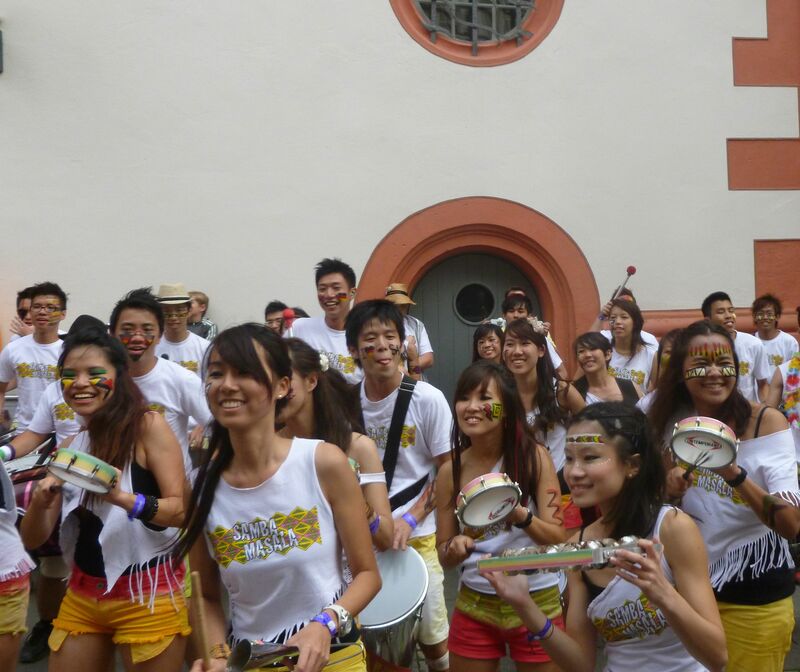 For example, Samba Masala from Singapore adds the Indian dhol drum to their repertoire, and several other Asian-based rhythms. 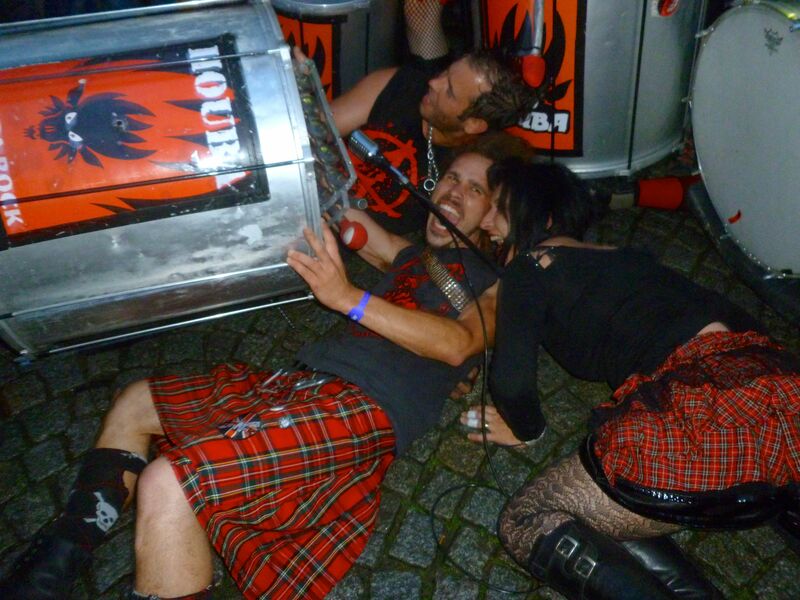 Kilt-wearing, head-banging Houba Samba from France brings their love for heavy metal into the fold. Every group has something different and amazing to share. Samba Masala from Singapore leaves it on the floor every single time. They are one of the most popular groups at the festival. Houba Samba from France. Because why not end your performance on the ground? When I was there, my biggest worry was the possibility that I would miss some of the shows I definitely wanted to attend. There were so many musicians blowing my mind! Was there a chance to see them all? My worries were unfounded however. Each band has their turn on at least one of the nine featured stages, and participate in several street performances, both planned and spontaneous. The vibe is incredible at the main stage. These kids were awesome. That’s all I can say. Visitors look so happy and relaxed. There’s plenty of space to meet with friends, eat, drink your favorite beer, and of course hear some incredible music. This festival is very family-friendly. Bring everyone! Every drummer’s dream! Well, most drummers anyway. 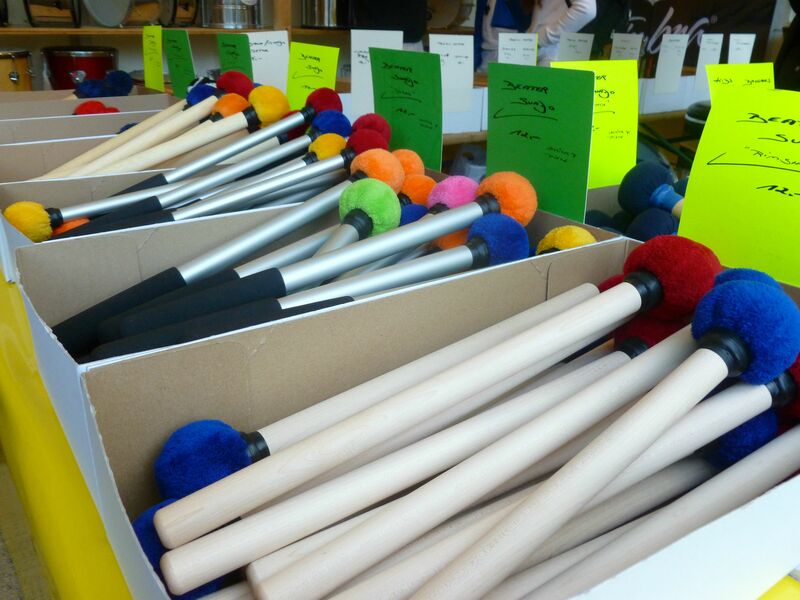 Mallets galore! I need these stat! Mestre Marivaldo Paim from Salvador, Bahia giving a drum workshop. 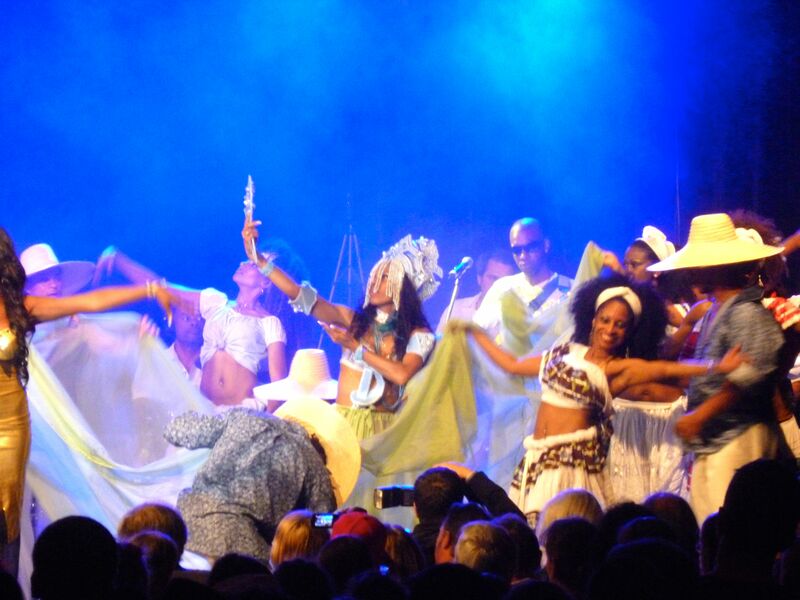 He is a noted director from Ile Aiye, one of Salvador’s best percussion groups. 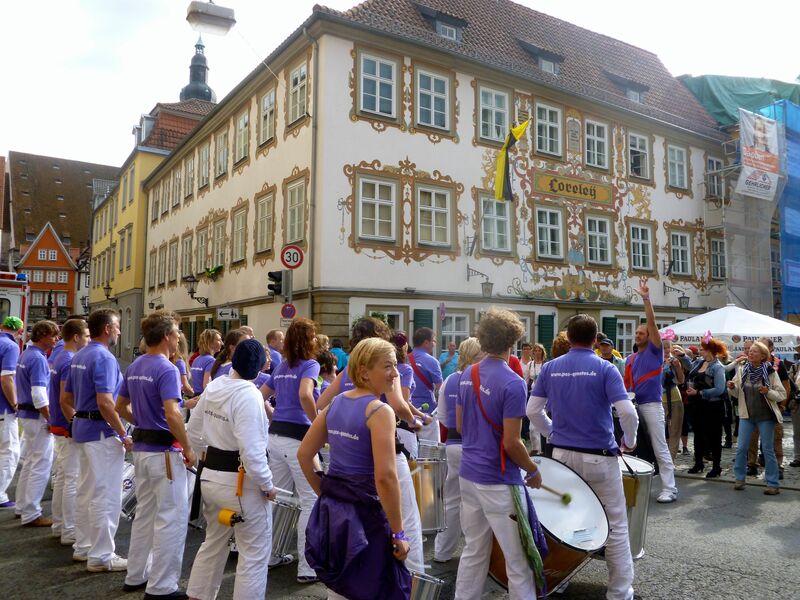 One of the best things about the Coburg Samba Festival besides the music? Getting to know new friends from around the world. 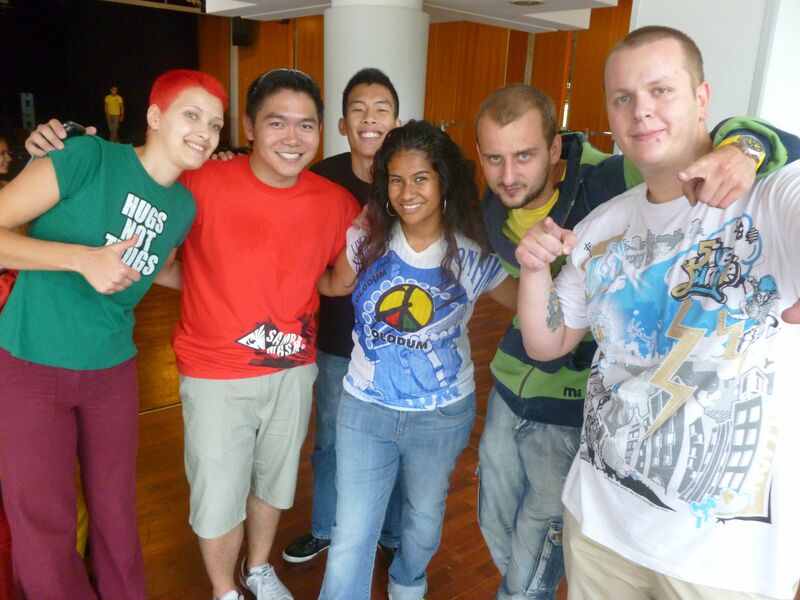 In this case, Singapore and Slovakia! 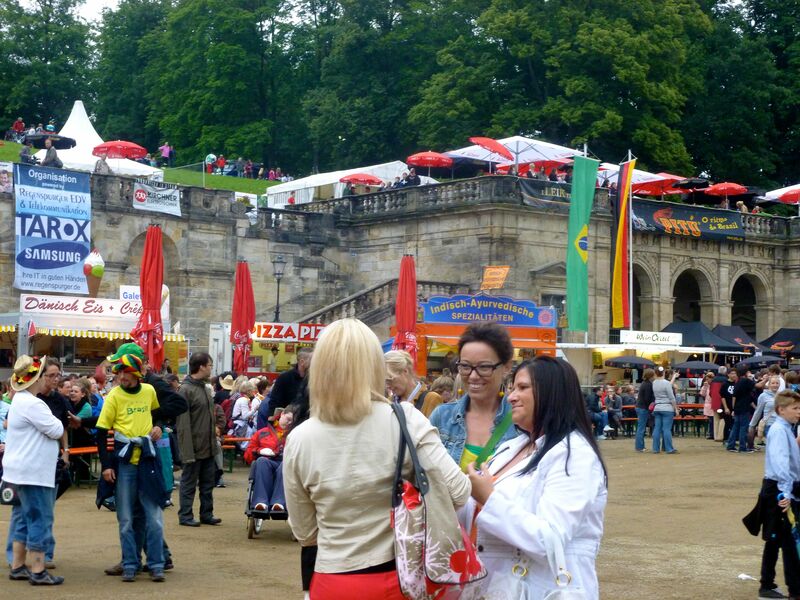 The captivating architecture, twisting cobblestone lanes, and narrow alleys make exploring the festival so much fun. At nearly every corner, drummers banging out pulsating rhythms and colorful dancers await. Moreover, there are many workshops taking place in various parts of the town, including drumming, instrument making, dancing, and capoeira. You can’t get bored— it’s impossible. 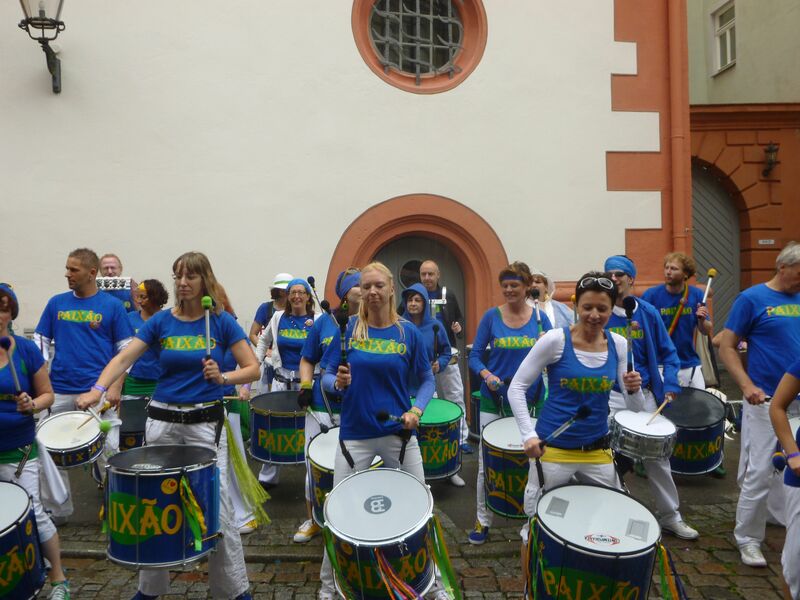 Push the Coburg Samba Festival to the top of your bucket list. You will have the time of your life! Getting there: The Deutsche Bahn ICE (Inter-City Express) train connects all the major German cities such as Berlin, Munich, Frankfurt, and Hamburg. I took the ICE from Berlin to Lichtenfels, the closest main station to Coburg. I really enjoyed riding that train! It was modern, had plenty of amenities, and was super comfortable. From there I caught a taxi to Coburg. The 20 minute ride cost me about 30 Euros. If you’re flying into Germany, Nuremberg is probably the closest airport to Coburg. Take the U2 subway line directly from the airport to the city’s central train station. Hotels in Coburg sell out fast— up to six months before the festival! Make sure to reserve your rooms by January. There are other small towns close to Coburg where you can book rooms, but you may need to rent a car. Taxi fares add up quickly! There are many natural hot springs in the area. If you have some extra time, take a day to pamper yourself! Try Obermain Therme in Bad Staffelstein or Bad Rodach Hot Springs. 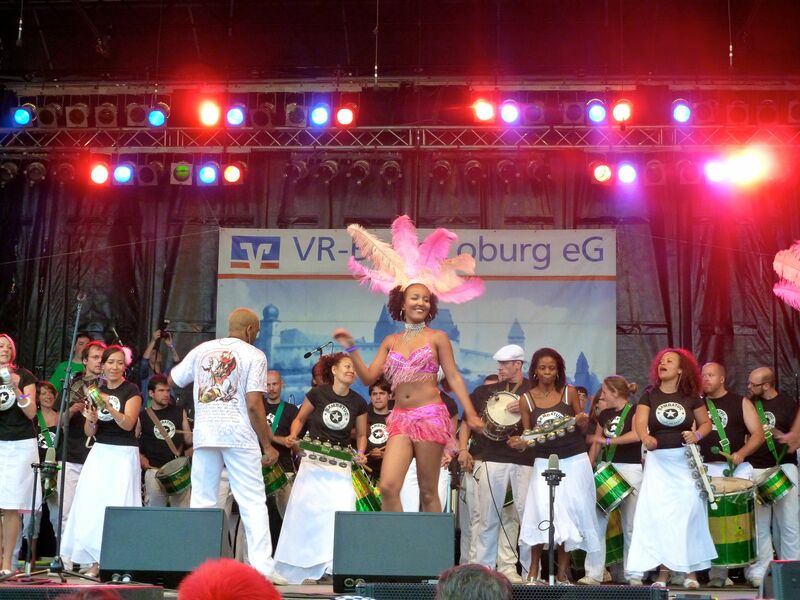 This entry was tagged bateria, Brazil, carnival, Coburg, dance, drum, Europe, festival, Germany, music, party, percussion, performance, samba, travel, travel blogger. Bookmark the permalink. 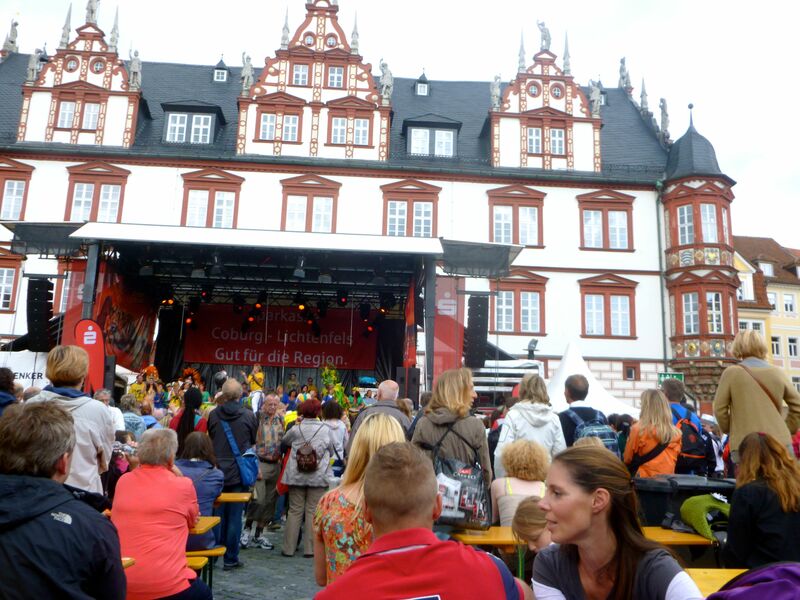 Immensely enjoyed this very interesting and enjoyable article about the Coburg Festival ! Love the photos. Many thanks! I’m a drummer who plays Brazilian music as well. I guess that’s how I got wind of it. Otherwise, I would have never known about it. I hope you get to experience it some day! 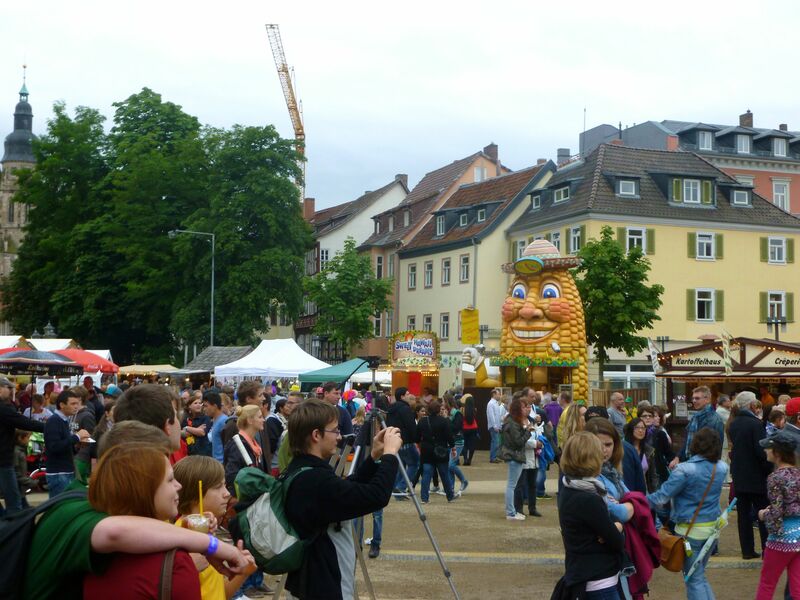 This would be the most unexpected festival ever in Germany! How fun and colorful! 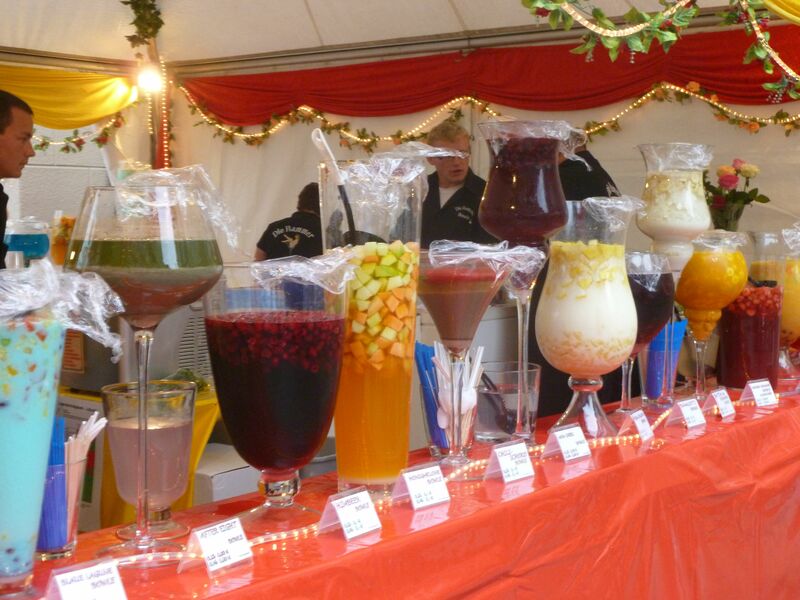 It’s so hot here in Munich right now, I’d love to try one of those fruity drinks! 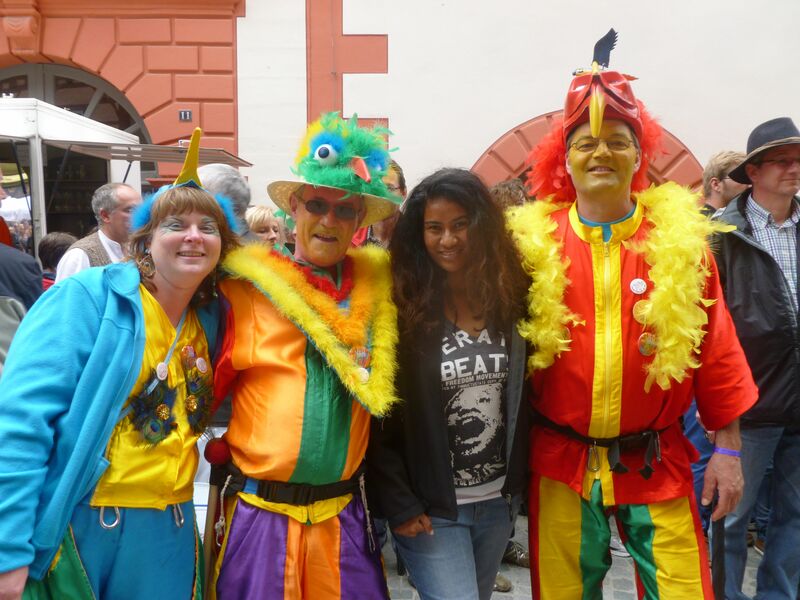 Carnival in Germany, I would have never guessed. Seems like so much fun. Those are some very colorful and beautiful costumes. Love the photos. Cool! I love reading about off the beaten path festivals like this. I looks like you had a blast! Looks like my kinda party! Each time I read new posts about Europe I think: “Seriously, do we have this here?” – no idea there was such a thing!! this looks like such a cute place to see, never mind the music, which looks super cool! i think the workshops would be pretty great too!